Please note: an updated version of the dataset is meanwhile available. 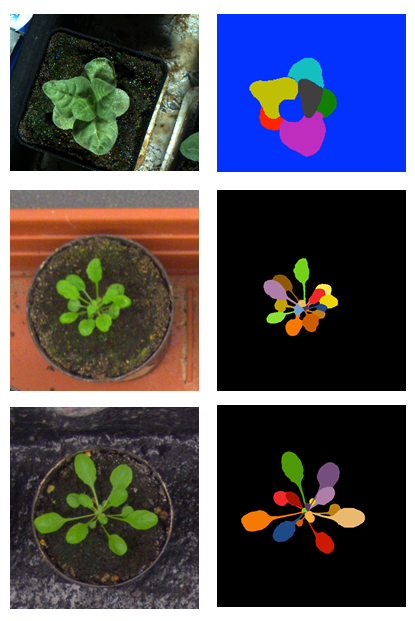 To advance the state of the art in leaf segmentation and to demonstrate the difficulty of segmenting all leaves in an image of plants, we organized the Leaf Segmentation Challenge (LSC). For the challenge we released a training set (which contains raw images and annotations, see example images on the right). Few days before the paper due date, a testing set was released, containing only raw images but no annotations. We will release the training data set here for further investigations. Massimo Minervini, Mohammed M. Abdelsamea, Sotirios A. Tsaftaris, Image-based plant phenotyping with incremental learning and active contours, Ecological Informatics, Available online 6 August 2013, ISSN 1574-9541, http://dx.doi.org/10.1016/j.ecoinf.2013.07.004. The technical report describes the data acquisition, plant material, and environmental conditions in detail. The paper by Minervini et al. documents the first experiment of the dataset.